AppleiPad Mini showing all the features of iPad in small and compact manner with beautiful design. Here what is most robust behind the design is technology used. I my last post Apple Unveils ipad Mini:Hands on features i compiled every important features of Apple iPad Mini including its beautiful design and technology. Here in this post I’m about to cover the Technology used and availability of hardware and its features unplugged. 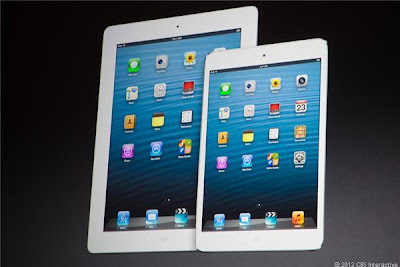 Apple ipad mini will be available in mainly two models; Wi-Fi and Wi-Fi + Cellular mode. As name suggests this will let you browse the net and stay connected via cellular network too. Apple iPad mini will be available in mainly two colors, Black and Slate/gray and White and Silver. Apple iPad Mini device process on Apple dual Core A5 Processor. Upto 10 Hour Surfing, Video playing and Listening music. Charging Via USB and power adepter. Build-in 16.3 Watt hour Rechargeable Polymer battery. Lightning connector, universal 3.5 mm mini jack, build in speaker and Microphone. Wi-Fi plus Cellular model have nano SIM tray along with this. In both models have 3 Axis gyro, Accelerometer, and Ambient Light sensor. AirPlay Mirroring to AppleTV 720p streaming. 3rd generation streaming 1080p and 2nd generation streaming 720p. Via AV cable, 720p to TV and 1080p via VGA cable. The specification and the pricing of iPad mini is really good. And apple manage to grab the good percentage of table market share with iPad mini. But I still prefer to buy the Nexus 7 which offer best specs and feature and also priced at better price point.